Tucked away about halfway down the hallway on the 8th floor of the 624 South Michigan building is room 803. This modest office is always popping with vigorous literary activity. That’s because it’s the headquarters of the Publishing Lab. And if you’re a writer, it’s a place you should visit often. Many writers have felt the frustration of submitting their work only to receive a rejection email after months of silence. We ask ourselves what went wrong when the submission represents our best work and we thought we did our research on the market before submitting it to what we thought was the right publication. It turns out that finding the right home for your writing is quite difficult. That’s where the Publishing Lab comes in. Publishing Lab staff hard at work on the new volume of The Lab Review. Current staff includes editor-in-chief Kristen Nichols, associate editors Hayden Moseley, Maria Schrater and Jeffrey Barbieri, and faculty advisor Ann Hemenway. This dedicated group helps new and upcoming writers find the best possible markets for their pieces. Established in 2000 by Jotham Burrello, who now runs Elephant Rock Books, the Lab has over 18 years of experience and market analysis. The staff consults with student writers, offers ideas on where to submit, and even makes editorial suggestions if requested. 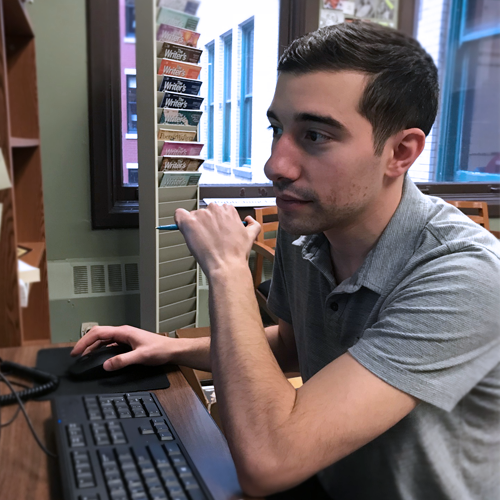 Associate Editor Jeffrey Barbieri, who is left-handed, searches for genre-fiction journals online. 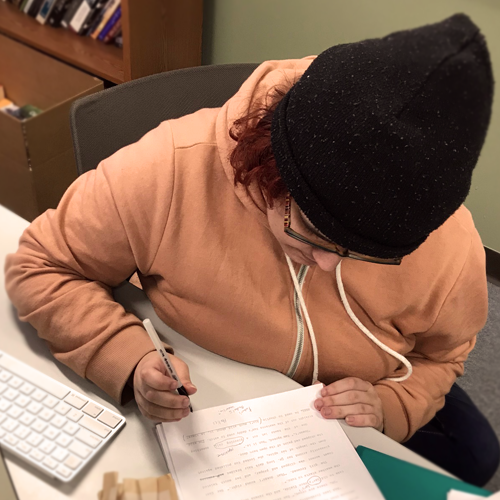 In addition to finding markets for new writing, staff also oversees publication of their own literary journal, The Lab Review, which is open to submissions from Columbia College Chicago undergraduates and graduate students. “The Lab Review is a first publication for many students, so it’s nice to help jumpstart a lot of promising writers by giving them their first exposure,” adds Jeff, who has just finished editing accepted nonfiction pieces for volume six. Except for Ann Hemenway, who is a full-time professor, the staff is comprised of individuals who themselves are students. I asked Jeff if being an associate editor for The Lab Review and a consultant for the submission of new works has given him any insights into his own creative process. “I’ve found it easier to be confident in my own work, knowing how many opportunities for publishing are out there. There are constantly contests happening and journals being published, and it helps to see that firsthand and understand that there is a place out there for my writing,” he says. Jeff’s optimism is backed up by his knowledge of the market. Any writer ought to be satisfied to know that the industry is healthy and seems to be expanding; that this means there are now more homes for good work of all genres than ever before. Associate Editor Hayden Moseley corrects errors in Jeffrey Barbieri’s essay. 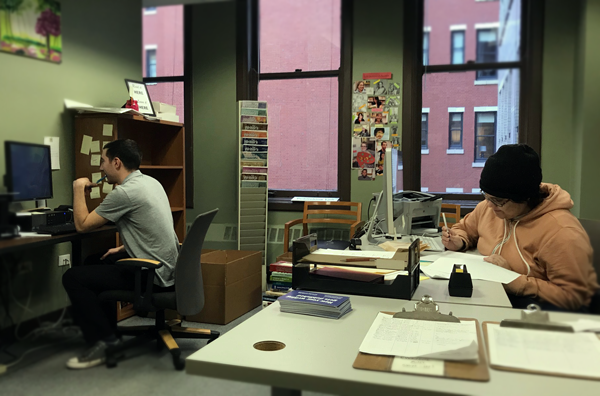 It’s wonderful to know that the English and Creative Writing department at Columbia offers a resource like The Publishing Lab, and that the Lab itself has a staff so open and generous with their time. If you’re serious about your writing, you owe it to yourself to make an appointment or even just stop by. I guarantee it will lead to a publishing credit for your CV.